Explore the mysteries of the unknown at this traveling exhibit developed by the Cincinnati Museum Center. In the Dark delves into dark environments and the unique animals, plants and humans that adapt to areas with little to no light. From a forest diorama of the Great Smoky Mountains to a recreation of a Kentucky limestone cave, five immersive zones enable visitors to experience the darkness of many unseen worlds. Using mechanical displays, life-size animal models and informational panels, this hands-on exhibit reveals what thrives beneath the soil, under the sea, in the shadows of night and within other dark environments. Visitors will learn how birds find their way flying at night, how bats use echolocation to communicate and ways people have reacted to darkness throughout history. Come immerse yourself in the world of darkness at In the Dark. 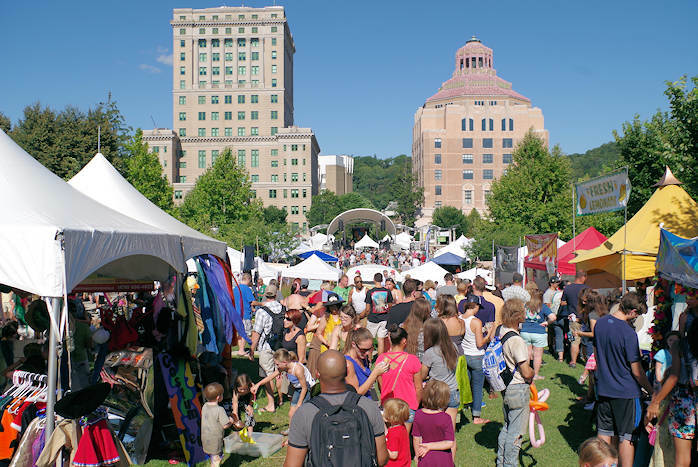 RomanticAsheville.com is delighted to be a sponsor! New in 2019! “Crafty Hour” arts and craft social series held the last Sunday of each month from 3 to 5 PM, led by Melissa Thomas of West Asheville’s Flora living boutique. Each workshop features a new project, designing your own personalized botanical masterpiece. Tickets are $67 for Arboretum members and $75 for non-members, includes personalized instructions, beverage, light food, supplies and parking. Hundreds of orchids fill the Education Center in this annual judged show that also features orchid plant and supply vendors. Educational classes offered throughout the weekend, and Orchid Society members are available to answer questions and provide orchid-growing advice. Read more about the Orchid Show. See how Science, Technology, Engineering, Art and Math (STEAM) are incorporated in everyday lives with exhibits from Western North Carolina schools as well as presentations from students. The annual Asheville-Blue Ridge Rose Society Exhibition features award-winning roses of every color and size. Experts will be on hand to answer questions and provide resources about selection, care and history of these beautiful garden plants. Rose plants and fertilizer for sale. Read more about the Spring Flower Shows. This two-day horticultural extravaganza, situated in the midst of the colorful mountains, features a display of bonsai from enthusiasts in a six-state region, live demonstrations, workshops, and a popular bonsai marketplace. It’s also the perfect occasion to explore the Arboretum’s Bonsai Exhibition Garden, which offers a world-class display that innovatively establishes bonsai in the context of the Southern Appalachians. See our North Carolina Arboretum Guide. The North Carolina Arboretum is located next to the Blue Ridge Parkway entrance ramp at Milepost 393. From I-26, take Exit 33 and follow Blue Ridge Parkway signs for two miles to the entrance ramp. Arboretum grounds are open 7 days a week. Property hours are 8 AM-9 PM, April-October and 8 AM-7 PM, November-March. The Visitor Education Center and Bonsai Exhibition Garden are open 9 AM-5 PM every day. Parking Fees: $14 per personal motor vehicle. No charges apply for pedestrians, bicyclists or North Carolina Arboretum Society members. Click here to visit their Web site.